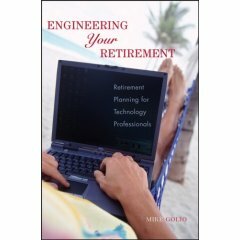 Retire Early Book Review -- Engineering Your Retirement, by Mike Golio. This article was first posted January 1, 2007. Dr. Mike Golio is a long time contributor to the REHP forum as well as several other early retirement discussion boards. The author of more than 150 technical papers and the editor of five textbooks in the field of electrical engineering, Mike brought his considerable research & development and publishing experience to writing Engineering Your Retirement. The book crystallizes what he he learned from his research on the topic over the 7 or 8 years that preceded his retirement in 2003 at the age of 49. Long on useful content and short on fluff, Engineering Your Retirement is written from the perspective of an engineering and technical professional. Practicioners in those fields will appreciate the author's direct writing style and frequent use of charts and graphs to illustrate important points throughout the book. Click here to order Engineering Your Retirement Today! Engineering Your Retirement covers the gamut of retirement topics from managing expenses, to how to invest, tax issues, obtaining health insurance, and "what to do after you retire?" A highlight of the book is Dr. Golio's indepth dicussion on how to safely withdraw funds from your retirement portfolio in Chapter 2 along with a description of the various analytical tools available to model the survivability of your retirement portfolio. Chapter 4 on emergency funds, insurance, and wills also contains much useful information along with an exhaustive checklist that should spur you to get your documents in order. Chapter 6 Your Investment Plan covers the standard caveats of the need for diversification, low fees, and an asset allocation that takes advantage of non-correlated asset classes. Dr. Golio also includes a discussion of often overlooked topics like longevity risk and the mechanics of rebalancing your portfolio. The book is carefully footnoted and provides a helpful list of web URLs for each chapter to assist readers looking for additional information. Engineering Your Retirement is a worthwhile addition to your early retirement library. It's highly recommended. Copyright © 2007 John P. Greaney, All rights reserved.